Cafe Mor’ish in Richmond Town’s serves breakfast, filling sandwiches and a whole lot of cosy and happy vibes. And they are easy on the pocket too! Cafe Mor’ish in Richmond Town, can easily pass off as a cute little bistro with minimal decor, wooden furniture, and bright and cheerful ambience. Broadly put, Mor’ish’s menu is all about salads, melts, wraps, sandwiches, and pizzas — everything that passes for cafe fare. They also have breakfast section that’s all about meaty omelettes, French toasts, and pancakes. We are told that the menu draws inspiration from Richmond Town and its neighbouring areas. Probably explains why Tom’s Hungry Man and Phenomolette from the breakfast section are named after Hotel Tom’s and St. Philomena’s Hospital. A round of Cutlet Mother Mori and Mini Falafel Pockets come highly recommended because the cutlets come with a chicken-potato stuffing (yummers) and falafel in pita bread can never go wrong! The melts, wraps, and sandwiches are perfect for a quick, filling lunch with the sandwiches served in a panini or focaccia. 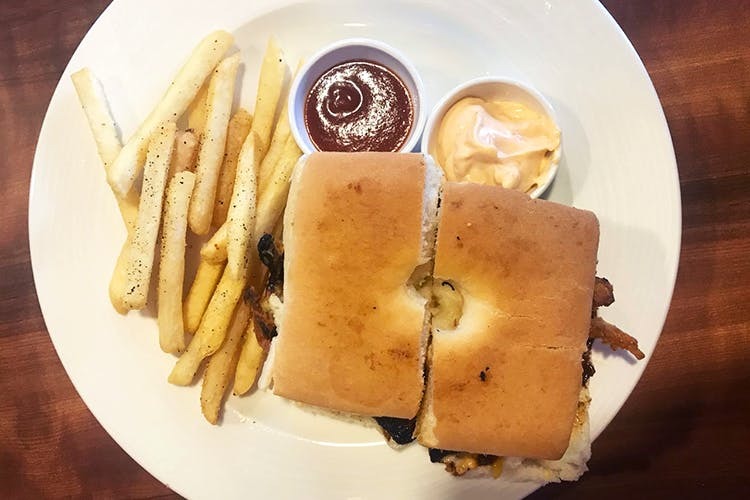 The BBQ Chicken Sandwich is our pick with fried onions, juicy, grilled chicken, and that melted mozzarella easily filling us up. The Pulled Chicken Sandwich, a signature, is something that one must try, we are told. Why? Well, it comes with pulled chicken in pepper sauce and a Viking bread. The bread is nothing but bread dipped in egg batter and grilled. A fancier version of your regular omelette sandwich, if you please. If you are stuffed at this point, go straight for the desserts such as sundaes and fudge brownies. There’s also The Mor’ish Hummus on the menu for all you hummus lovers! And don't forget to try the Koubiden Quesadilla, which is the cafe’s take on quesadillas with Persian influence courtesy grilled lamb mince!